The popularity of corset holsters and belly-bands is understandable. Softer breathable fabrics and a lack of poking hardware and plastic make them more comfortable for many concealed carriers. Some of the styles can be used in versatile ways and offer slimming compression and excellent concealment. Despite the benefits, however, there is one glaring issue that needs to be addressed – adequate trigger protection. Testing your holster is easy. Of course, clear the firearm first and then holster it as you normally carry. If you can poke a finger in and press the trigger from the outside of the holster – you have a problem. As you do this, think about little kid fingers reaching for attention, an excited dog with its paws/claws poking at your midsection, a stray branch on a shrub in the parking lot of the grocery store or even an attacker that grabs you from behind. All of these things could potentially cause a BANG when you aren’t expecting one. All of that being said, I own and sometimes wear a soft-sided corset holster myself. My favorite is the Lace Corset Holster made by Femme Fatale. The fabric is comfortable for long periods of time and the compression it provides allows me to conceal my gun under normal everyday clothes. Although many women enjoy the challenges of wardrobe selection, I like not having to fuss around trying to “dress around the gun”. For me, this holster is extremely versatile because, although it was designed to be worn as a corset with the gun residing just below the bra line, I can wear it lower more like a belly-band. In this setup, my gun rides closer to my hip-line and my draw is similar to a traditional strong side IWB/OWB holster. Additionally, I can rotate the holster around so my draw is anywhere from center-line all the way around to the small of my back. By itself, the Lace Corset Holster is made well and is quite sturdy on its own, which is why I chose it in the first place. However, because I have little ones around me most of the time I prefer all of my holsters to be “hard-sided” for maximum safety, consistent draw-ability and for easy one-handed re-holstering. 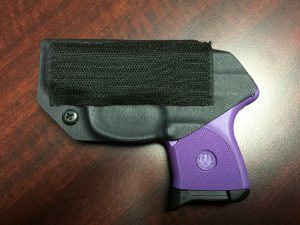 I shore up my corset holster with our kydex UltiClip IWB Holster. 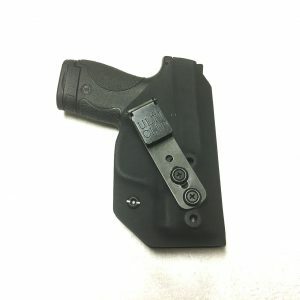 The kydex holster simply slides down into the pocket on the corset and the UltiClip snaps tightly onto the fabric at the top. The kydex is custom fitted and keeps my gun in exactly the same place at all times. Also, the UltiClip keeps the grip of my gun fully above the fabric line which allows me to get a good purchase on the gun when drawing. Of course, the hard kydex provides maximum trigger protection and allows me to easily re-holster, even with one hand if needed. If I decide I’ve had enough of the corset for the day, I just remove the kydex holster and affix it IWB style in my pants, with or without a belt. Another option for making your corset or belly-band more sturdy and safe is to use our kydex Purse Holster. These are designed to fit inside the holster pocket on concealed carry purses, but they can be placed into the pocket of the Lace Corset Holster or any other belly-band as well. The Purse Holster comes with hook Velcro attached to the holster itself and a piece of matching sticky-sided loop Velcro made for adhering wherever you want to place the holster. The compression of the corset or band itself helps hold the loop portion in place, but I suggest stitching the loop side to the holster fabric to ensure that it stays in place as the corset or band stretches. I like this solution because the angle of the Purse Holster can be changed to suit your need and it can be removed easily and placed into a carry purse as the situation dictates. I understand as well as any other lady out there the comfort and versatility of soft-sided corset or bell-band holsters. And while comfort is important, it is up to each of us to make decisions about how to carry safely in our respective environments. On top of ensuring safe carry, the ability to draw quickly and re-holster with one hand is something that you should consider. If you work these critical skills into your training routine, you’ll know right away if the corset or belly-band holster you have chosen meets your needs. Hopefully, the simple additions mentioned above will help you maximize your safety, versatility and performance.